We enable you to collect data from multiple devices, store and analyze them with AWS IoT. We create applications that enable you to control these devices from your phones or tablets. IoT is here to stay, and to shake up enterprises. Organizations world over are leveraging the power of connectivity to boost results. We get on board with AWS IoT and help build solutions for diverse business problems. Connect devices, networks and people – take your business to new heights. Our AWS IoT integrated services lets your connected devices easily and securely interact with your cloud applications on the fly. Our Solutions support millions of devices and billions of messages, and can process and route those messages to AWS endpoints and to other devices reliably and securely. Your applications can keep track of and communicate with all your devices, all the time – even when they aren’t connected. We make it easy to use other AWS services with easy integration to AWS IoT , now you can build value-added IoT applications that gather, process, analyse and act on data generated by connected devices, without having to manage any infrastructure. Connect billions of devices and keep track to operate seamlessly. We offer unique opportunities for enterprises to hyper-connect people, devices and systems. 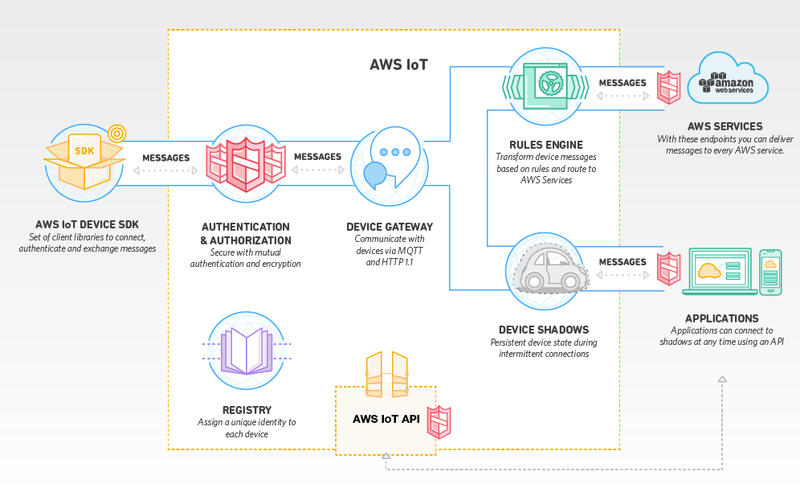 AWS IoT supports HTTP-MQTT, a communication protocol designed specifically to handle sporadic connections, reduce code footprints on devices, and minimize network bandwidth usage. AWS IoT authenticates and encrypts data from end to end through all points of connection, meaning you can be rest assured your devices will never exchange data without first guaranteeing a proven identity. By storing the latest state of all your devices, AWS IoT lets you read or set any device at any time. Even if they’re not connected, you can make adjustments to be implemented when devices are reconnected. Remotely monitor vehicle performance and driver behavior using telematic sensor data to text those metrics with insurance premiums. Use bio-metric sensor data from patients to alert doctors early so they can prevent medical emergencies. Give your users the tools and toys to quantify their lifestyles with wearable tech, analyzing diet, exercise, sleep, and the rest of their activities. Present enticing offers to shoppers using in-store beacons and purchase history data as they walk through your store.